So what does that mean in English? It means the EPA would not be allowed to spend money to work on the Renewable Fuel Standard. At first blush it would seem if this amendment were successful it would be a huge win for American drivers, conservatives, and free market advocates. Unfortunately, these things are often more complicated than they seem. While this amendment would prohibit EPA from implementing, administering, or enforcing the RFS it does not change the law—and that is the key. The law would remain on the books and industry would still be responsible for meeting the law despite EPA’s limitation of funds. This could actually lead to worse outcomes for consumers than what the existing landscape provides. 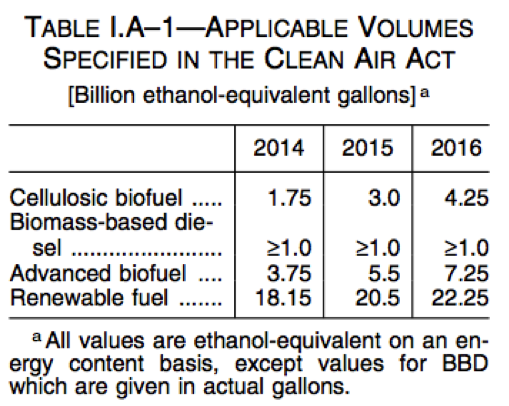 While EPA’s administration of the RFS has been a train wreck, sometimes they have at least acknowledged reality and used their waiver authority to reduce the amount of biofuels that must be blended into the fuel supply below the statutory levels. This is good for anyone who buys gasoline. EPA has used its waiver authority to propose volumes for 2014 – 2016 that are significantly lower than what Congress called for in the statute. The following table shows EPA’s proposed volumes for 2016 are about 5 billion gallons fewer than the statute. Eliminating the funds available for EPA to implement the RFS could result in EPA losing its waiver authority. If that happens, mandated volumes could revert back to the statute, forcing Americans to use even more biofuels. This unintended consequence of the Loudermilk amendment would harm American families. Lastly, it is important to note this is not the same situation as an amendment that prohibits the administration from spending money on something like the “social cost of carbon.” The SCC is not tied to any law passed by Congress so a prohibition amendment is appropriate in this situation. The point here is that Congress needs to be careful when considering funding prohibitions tied to statutory laws, as some will have unintended consequences. The Loudermilk amendment is well-intentioned, but it appears that it will do more harm than good. If Congress wants to stop the harmful impacts of the RFS then they need to completely repeal the entire program. That is the only solution to this problem. The American Energy Alliance is supporting H.R. 703 by Rep Goodlatte and S. 1584 by Senator Cassidy completely repealing the RFS and we urge all Members of Congress to support these important pieces of legislation.